Hailing from Shakespeare’s own ‘fair Verona’ (one of the most beautiful cities in Italy), where they formed in the mid-Nineties, D.F.A. (acronym of Duty Free Area) are living proof of the old Latin saying that a prophet has no honour in his own country. Hailed as one of the best progressive rock bands of the past decade, they took the NEARfest audience by storm in 2000, and offered a stunning repeat performance in 2009 – when I first saw them, and was floored right from the opening strains of their set. However, as seems to happen all too frequently, they are barely known in their home country, where their extremely elegant yet punchy brand of Canterbury-tinged jazz-rock starkly contrasts with worship of all things Genesis that is still widespread in Italy. That historic first NEARfest performance was captured on the band’s 2001 live album, Work in Progress, which for over seven years remained the last testimony of the band’s activity. D.F.A. are nothing but pure class. A quartet reproducing the configuration of bands such as Hatfield and the North and National Health – with both keyboards and guitar in a prominent role, and the occasional contribution of other instruments – they are one of those rare outfits where each member’s contribution is essential to the band’s overall sound. Even if drummer Alberto De Grandis – a drummer that, like Christian Vander or Daniel Denis, is much more than a simple timekeeper – gets most of the composing credits, all of the instruments get their chance to shine and create a tightly woven mesh of sound. Alberto Bonomi’s multilayered keyboards lay a lush tapestry for Silvio Minella’s brilliantly expressive guitar work; while Luca Baldassarri’s bass provides ever-reliable bottom end, adding fullness and texture to De Grandis’ propulsive drumming. 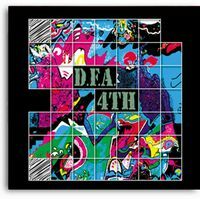 D.F.A.’s music is effortlessly fluid, yet complex enough to please the most demanding jazz-rock fans – striking a perfect balance between technical skill and genuine emotion, breathless dynamics and captivating atmospheres. Taking a leaf out of Soft Machine’s book, the album’s title is a simple numeral – not surprising, in the light of their affiliation with Leonardo Pavkovic’s far-sighted MoonJune label. Though it runs at almost 70 minutes, unlike the majority of albums running at over an hour it never outstays its welcome, and always manages to hold the listener’s attention. Most of the six tracks are instrumental, with one notable exception (on which more later). Interestingly, though D.F.A. do not sound as typically ‘Italian’ as those bands who opt for a more traditionally symphonic sound, they possess the inimitable flair for melody that seems to be ingrained in most Italian musicians. Their music is never harsh or needlessly convoluted, yet it also manages to eschew that somewhat overblown theatricality that can turn people off Italian progressive rock. It would be unfair to the band, however, to imply that they are mere Canterbury imitators. While D.F.A have a definitely international appeal (as proved by their choice of giving their composition titles both in Italian and in English), their Mediterranean inspiration – even if thankfully untainted by the overly sentimental excesses of Italian melodic pop – can be often keenly felt. This is one aspect that D.F.A. share with historic jazz-rock outfits such as Area, Il Baricentro and Napoli Centrale. Chosen to accompany the opening images of the documentary film Romantic Warriors, “Baltasaurus” introduces the album in charmingly subdued mode, a feature shared by most of the tracks. Elegant guitar licks and flawless rhythm section lead the way for a splendid, mid-paced development, in which keyboards and guitar seamlessly interact, bolstered by De Grandis’ stunning drum work – never overwhelming, but very much a protagonist. Gently atmospheric sections alternate with more energetic ones, and the many tempo changes do not break up the smooth flow of the music. The following number, “Flying Trip”, picks up the Canterbury references with a wistful mid-tempo spiced up by occasional jazzy, Latin-flavoured passages, and featuring some stunningly beautiful organ passages and delicate flute; while the barnstorming “Vietato Generalizzare” (It Is Forbidden to Generalize – the track with which D.F.A. opened their set at NEARfest 2009) barges in, propelled by a vertiginous synth riff and high-energy drumming. Very much guitar-driven, it allows Silvio Minella to display his considerable chops in an intense, expressive solo reminiscent of Gary Moore during his Colosseum II tenure. “The Mirror”, on the other hand, is a classic jazz-rock workout, with the instruments creating a keen, somewhat darker-hued sense of tension – though eased by snippets of muted singing at the beginning and in the middle of the track – and climaxing with an arresting, yet subtle drum ‘solo’. That leaves the album’s epic, the almost 19-minute “Mosoq Runa” (Quechua for “new human being”), which, not surprisingly, displays a definitely more symphonic bent – thanks also to the presence of strings, as well as a recurring main theme. The amazing interplay between the instruments is nowhere more evident than here, and – in spite of its running time – the track never once feels overlong or overdone; as usual, both the guitar and the keyboards get their chance to shine, with Minella’s soloing at its most soulful. However, 4th’s most distinctive track is strategically placed at the close of the disc. Sung entirely in the ancient Sardinian language (the most archaic of Romance languages) by the heavenly voices of the folk trio Andhira, “La Ballata de s’Isposa ‘e Mannorri” (The Ballad of the Bride of Mannorri) is a tale of love, betrayal and vengeance that would be perfectly at home on a Pentangle album – in spite of the frequent comparisons between Andhira and Canterbury’s own trio of female vocalists, The Northettes. The three Sardinian vocalists, though, are less operatic and more emotional; the resonant contralto timbre of one of them lends even more depth to their performance. The minimalistic instrumental accompaniment does not divert the attention from the sheer beauty of the vocal interplay – though the bridge features a lovely, touching guitar solo that seems to echo the profound sadness of the story. At the time of writing, D.F.A. are reported to be on indefinite hiatus, due to the all too familiar pressures of ‘real life’ (i.e. family and work) on any non-professional musician. It may even be that the band has reached the end of the road – which would obviously result in a great loss for the whole progressive rock scene. However, even if they indeed decide to call it a day, they will have left a lasting legacy in the history of progressive rock, both for the beauty and power of their music and their genuinely down-to-earth attitude – as captured in the aforementioned Romantic Warriors.. Needless to say, 4th is a must-listen for devotees of the Canterbury scene and classic jazz-rock, and very highly recommended to prog fans of every persuasion. This is one of the landmark albums of the first decade of the 21st century, and one of the very best productions to ever come out of the Italian progressive music scene. Great to read your informed opinion and take on this extra-super-extraordinary band, Raff! I loved your comparisons to Hatfield and The North and the other italian bands that except for Area I have not heard off. It would certainly be a big loss that these guys stop making music (i doubt it, and keep my fingers crossed). Just posted your review on the Romantic Warriors’ FB fan page http://on.fb.me/eiBbvc. This time I have already the CD and I’m ready to enjoy them. Your review is yummy, Raffa, many thanks! Kinda like an Italian Return to Forever, eh? Without a tad more rock, a tad less jazz than Chick Corea et al. I don’t know about Return to Forever… I don’t really care about them, and I think the Canterbury comparisons are more appropriate. However, as a long-time reviewer, I know that each person hears different things when listening to music!